Dr Dvora Joseph Davey has more than two decades of experience in the development, management and evaluation of HIV prevention and treatment programs in Africa. 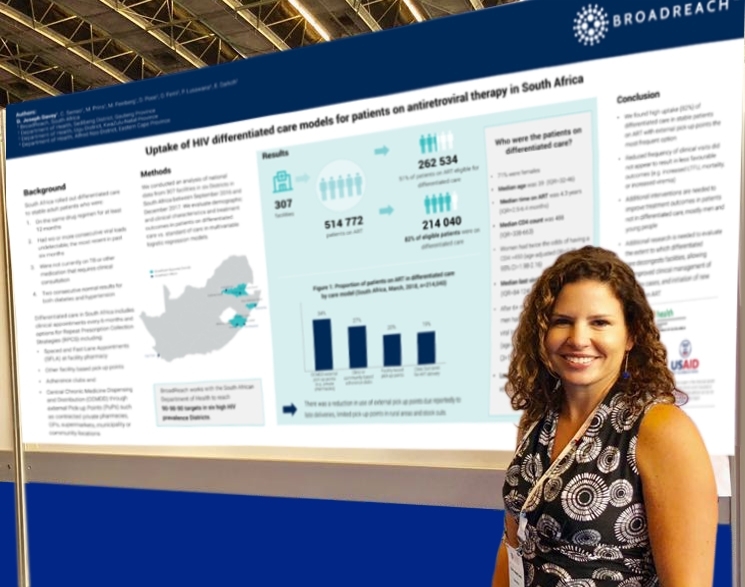 She presented a research poster titled “Uptake of HIV differentiated care models for patients on antiretroviral therapy in South Africa” at the 22nd Annual International AIDS Conference in Amsterdam. Conferences like AIDS 2018 are incredibly important meeting points for our work. They are a place to learn, share ideas and connect with colleagues – an invigorating and exciting opportunity to network and hear about the very latest science and programmatic successes, so we can push ourselves to build more effective programs that save even more lives. Much of my work as a researcher is studying which interventions have the potential to have the biggest impact on preventing and treating HIV, bearing in mind the ambitious race to meet and even surpass the UNAIDS 90-90-90 treatment targets to end the epidemic. It is evident that to reach this goal, that innovative, tailored interventions are required. I recently presented one such service innovation that BroadReach piloted, in partnership with the South African Department of Health, in six high prevalence districts between 2016-2018. We rolled out differentiated HIV care in those districts to make access to care for HIV infected patients simpler and more accessible and improve retention in care and viral suppression. In South Africa we rolled out differentiated care to stable adult patients who had been on the same drug regimen for more than 12 months, had more than two consecutive viral load laboratory results, and who were not currently on TB or other medication that required clinical consultation. Rather than go to regional clinics and queue for hours for their medication as usual, patients were able to collect it at convenient locations such as local pharmacies, fast queues in clinic pharmacies, or adherence clubs, and collect multiple months of antiretroviral therapy (ART) at a time. We saw a high uptake of the service where 87% of the over 260 000 eligible patients took up the opportunity to be enrolled in differentiated care. The most popular model was community or private pharmacy pick up, which offers anonymity and convenience that may not be available at regular clinical ART pick up. These kinds of interventions for healthy patients have been shown to greatly increase treatment compliance – particularly among men, whose health-seeking behaviour is different to that of women and whose working commitments can be prohibitive. After six or more months on differentiated care we found very low loss to follow up (<1%), meaning that people stayed on treatment, and low mortality. However, men were more likely to have a high viral load (>1000 copies/mL), i.e. did less well on treatment, after six months on differentiated care compared with women. Innovations like this are essential to make HIV services more accessible to ensure that patients stay on treatment and achieve viral suppression. However, additional research is needed to evaluate the extent to which differentiated care decongests facilities, allowing for improved clinical management of complex cases, and initiation of new patients on treatment. Differentiated care for HIV infected patients is a huge stride forward in simplifying treatment for healthy patients, taking us ever closer to the UNAIDS 90-90-90 goal for 2020. BroadReach has delivered successful health system strengthening programs throughout sub-Saharan Africa. Since 2008, BroadReach has worked with USAID South Africa and the South African Government to achieve HIV epidemic control: focussing on prevention, care and treatment. BroadReach is currently implementing the USAID/South Africa Health Systems Strengthening for Better HIV/TB Patient Outcomes Program (Oct 2012 – Sep 2018). The creation of this material was made possible by the support of the American People through the U.S. Agency for International Development (USAID) under the Cooperative Agreement No. AID-674-A-12-00016 and No. AID-674-A-12-00038. The contents are the responsibility of BroadReach and do not necessarily reflect the views of USAID or the United States Government.